A successful ecommerce marketing strategy is an ever-changing blend of techniques and tactics aimed at achieving specific, predetermined goals. If executed well, email marketing is often one of the most effective means of achieving those goals. 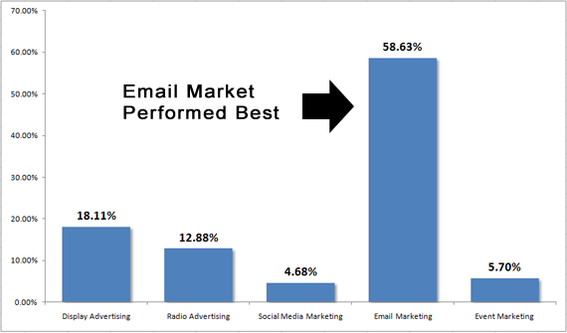 But what does it mean to execute an email marketing campaign well? What techniques and choices make one email better than another. In this article, you’ll find seven ways to make your email marketing better, including a short case study demonstrating just how effective email can be. Recently, a regional retailer in a niche market conducted a campaign to build a list for a new texting initiative. The ultimate goal was to have a list of shoppers to which the retailer could send monthly specials via text message. Text marketing, as a tactic, is known to drive immediate actions, and the retailer wanted to augment what it was already doing with social media, advertising, and email marketing. To build this list, the retailer employed five marketing tactics: display sign advertising, radio advertising, social media marketing, event marketing, and email marketing. In each case, potential customers were asked to text a specific and trackable code to a particular number for a chance to win free merchandise. The retailer invested about $250 in display advertising; $3,750 in radio promotions; and less than one hour of labor in social media and email marketing combined. It also used a portion of a previously negotiated event sponsorship for promotion. The campaign lasted one week. It is also important to mention that the social media part of the campaign amounted to a single post on Facebook, Twitter, and Foursquare. The email campaign included two mentions in the company’s regular email newsletter. The retailer’s newsletter is well established, and it typically includes links to two or three relevant articles, coupons, discount offers, links to video content, and contest notifications. In the end, the email marketing accounted for 58.63 percent of the text messages collected, making it by far the most effective marketing tactic employed. What’s more, given that the email campaign added nothing to the retailer’s marketing budget, it also presented the lowest cost per action — no more cost, but the retailer did have to build the list over a couple of years. As a comparison, the next most effect tactic, display sign advertising, cost about $1.08 per phone number acquired. Radio advertising was the most expensive at $22.73 per number. This chart shows the effectiveness of each marketing tactic relative to the total number of phone numbers acquired for the texting list. There are at least seven ways to improve your email marketing, making it more successful, according to a new whitepaper — available here as a PDF — from Bronto Software, a leading email platform provider. An email list always should be growing and improving. From a marketing perspective, list growth starts with excellent content. Getting an email from your ecommerce business cannot be mundane, rather it needs to add value. What’s more, marketers should be sure that email subscription forms are easy to use, that they clearly explain the value in registering, and that they are offered often on site and in social media. Subject lines, alt tags, and pre-header content are three very basic email-marketing elements that businesses often overlook, according to Bronto Software. “The subject line is the first and possibly the only introduction to your campaign that your subscribers may ever see. Take the time and effort to create a truly relevant, engaging subject line that entices subscribers to open. For instance, if you are going to promote a percentage discount or free shipping, it’s critical to communicate the offer to your subscribers immediately. It’s surprising how many companies miss the mark on clearly stating the offer within. For example, if you want to promote $25 off a purchase of $100 or more, the subject line that is going to initiate the subscriber to open is ‘$25 Off Your Next Purchase,’ not ‘Preview our Fall Inventory,'” wrote Bronto in its Seven Email Marketing Refreshes whitepaper. Likewise, alt tags, which describe the text that appears when an image is not loaded, should include strong calls to action that will compel recipients to (1) download the accompanying images and (2) take action. Finally, pre-header text, which can be a list of email content or action items, is another excellent way to engage recipients. REI uses subtle pre-header text offers in its email marketing. HTML emails are the order of the day, and while there is not a true email, HTML standard, marketers still have a significant amount of control of email design and appearance. This includes some basic CSS. As a result, it makes sense to try to make your email look good with HTML and CSS, instead of relying on images alone. Don’t necessarily avoid images, but if CSS will do the trick, it is probably the better solution, especially when you consider that perhaps 30 percent of recipients will have images turned off in their email client. Relying on data from the Relevancy Group and eMarketer, Bronto Software found that a relevant email marketing campaign that considers a recipient’s preferences or purchase history will cost 3.7 times less than sending blanket emails to an entire list. So savvy email marketers may wish to segment their email list, targeting customers based on known preferences. The campaign should also be timely so paying attention to when a customer purchased last can also help. Shoppers are likely becoming accustomed to interacting with companies on websites and in social media. Email marketers can often gain loyal customers by engaging recipients with a social sharing opportunity or interactive content. According to a MarketingSherpa report — in PDF form — 81 percent of marketers believed that social sharing had made their email marketing more effective. Of course content needs to be share worthy, and, perhaps, nothing fits this need better than video. “Think about how you would like to reinforce your brand through video, and include video within your email marketing program,” the Bronto Software whitepaper advises. It is also important that ecommerce marketers track just how effective their email marketing is. In the case study mentioned at the beginning of this article, the marketers only discovered how well email had performed because they had set the campaign up in such a way that each marketing tactic could be identified in a unique way. If you want to improve your email success, be careful to set up meaningful means of measuring success. Analyze each new campaign’s results, and seek to improve those results. The Bronto Software whitepaper had one last suggestion for improving email marketing, use automation. “Trigger based email marketing is extremely effective because it provides a one-to-one touch based on the relationship between you and your subscriber. To be successful though, you must be certain to define your business rules, set frequency limits…Automated campaigns can trigger timely and relevant messaging that a subscriber is often excited to receive” Bronto Software said.